The Hotel Rhodopi Home is situated in Chepalare, approximately 14km from Pamporovo & a complimentary shuttle bus is provided to the Pamporovo slopes which runs twice in the morning & three times in the evening. The hotel location is ideal if you want to be close to the ski stations but don't want to be in the thick of the apres ski action at night. The hotel only opened in September 2006 and is still in a very new & fresh condition. The rooms are cleaned well with fresh towels provided daily. The bedrooms are provided with twin or double beds, side units, ample wardrobe & storage space, telephone, mini-bar, sofa & satellite TV (only 4 English speaking channels, BBC World, National Geographic, Discovery & CNN). The bathrooms are fully & tastefully tiled, full size bath with shower over but without a shower screen or curtain, the toilet has full & half flush facility but no spare toilet rolls were in evidence, there is also a fixed hair drier, waste bin & sanitary towel disposal bags. The heating of the rooms was more than adequate & each room has a balcony. The reception area comprises reception desk with currency exchange facility, 2 shops, small lobby bar/seating area, larger seating area comprising 6 leather sofas & 2 leather armchairs which are comfortable although very low to the floor which could be a challenge to the elderly or infirm. There is also a wall-mounted flat screen TV and a lovely designer open fireplace (logs) which unfortunately wasn't always in operation. A negative of this particular area is that there is a single entry door which means a very cold draught blowing through every time the door is used. Beverage prices in the lobby bar for coffee, alcohol & snacks are reasonable. The restaurant is pleasant albeit rather functional, the food is passable for a Bulgarian 4 star hotel ( we only had the one horrendous evening meal), breakfast is buffet with ample choice of cereals, hot food, breads, fruit etc. Dinner for us was via 3 set choice menus which had clearly been designed with a Bulgarian idea of the British palate, this didn't always work. We had problems with the restaurant staff regarding the timing of course delivery to the table, we eventually had to start sending food back to the kitchen to avoid having all 4 courses on the table at the same time, this situation can be rectified by proper staff training. We also found the staff habit of hovering in order to promptly remove crockery & cutlery overly disconcerting. The hotel doormen/porters job description would be an interesting read as they very rarely opened the door for guests and never assisted with luggage. For entertainment there is the TV in the reception area, there is a resident night club which is not open every evening and also a spa area with free usage of the swimming pool and various other activities which must be paid for, there is also a conference suite available. I would definitely visit this hotel again. We stayed here in January 2007 for a skiing holiday - my first for 20+ years and my partner's first ever! We were there at the same time as Brian Muir (see his review)and, indeed, enjoyed the company of Brian and his wife. Largely I would echo Brian's comments which very accurately reflect the experience of this hotel. The lift: The hotel has 4 floors; there is a small lift serving the upper floors. Whatever you do, never, ever, use the lift if there are three or more of you! When three or four people get in, and press "4", the lift starts off, gets to the third floor, and then there is a huge BANG! and the lift jolts alarmingly before stopping totally. If you press "4" again, it sets off and arrives at the fourth. The jolt and slight drop is very scary though. We did report the problem, and the lift was taken out of use for a day and a half, but alas! Nothing changed. When we were there, spectacularly low! On the mountain, a half-litre bottle of the local beer (very tasty!) would set you back 5 lev. 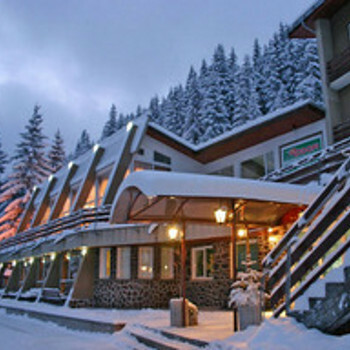 In Pamporovo resort, it would be around the 4 Lev mark. In the hotel, it was 2 lev, and we found a delightful little bar just down the road where the draught beer was a startling 1.1 Lev! !